It is good news that the rate of premature birth is down in the U.S. by about 1% from its 2006 high of 12.8%. It is bad news that one out of eight babies born in America (11.7%) is born too soon. With World Prematurity Awareness Day tomorrow, there is a flurry of coverage of the Lancet’s report about five proven strategies to reduce preterm birth. But nowhere is there mention of the solid research about preventing prematurity early in pregnancy! Curt Sandman’s lab has been funded for over thirty years by NIH (National Institutes of Health) to study the effects of maternal stress on fetal development and birth outcomes. I was fortunate to have Curt as one of my primary doctoral advisers, and he has taught me for years that maternal stress during pregnancy correlates with many different suboptimal outcomes, including preterm labor. (They sometimes refer to it in their science-speak as “short gestational age.”) He has also kept me current with their leading-edge findings about just how early prematurity risk shows up. There is a cascade of lifelong challenges that comes with prematurity — for the parents and for the child. Those born prematurely face developmental, health, learning and social challenges, and parents of preemies face a gauntlet of hurdles beginning with their child’s NICU confinement. (It often begins even earlier, with valiant attempts to forestall labor.) There is widespread agreement that preventing prematurity is one of the best investments we can make in the health of individuals and in the wellbeing of our society at large. 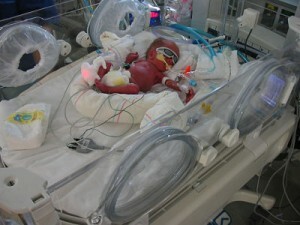 But little popular attention has been paid to preventing prematurity early. That sounds like an oxymoron, right? Detecting prematurity early? Preterm is defined as before 37 weeks, and the conventional perception is that something happens around that time to kick off labor too soon. Ready for a stunning finding? Researchers can predict likely preterm labor as early as 16 weeks gestation! A pregnant mother’s levels of a stress-related chemical called corticotropin-releasing-hormone (CRH for short) between 16-20 weeks can identify her as being at risk for preterm labor. You see, labor isn’t merely an add-on process at the end of pregnancy. Labor is an inherent element in the complexly interwoven tapestry of pregnancy. I find it helpful for understanding these seeming puzzles to take a wide and long view (as is my inclination always) of pregnancy and birth within a context of recognizing that Nature elegantly equips us with capacities and mechanisms to make things work well. When we take that kind of view (I call it an “adaptive perspective”), we can begin to see why there would be indications of prematurity risk as early as four months into pregnancy. Who Starts Labor, Mom or Baby? In the course of researching the onset of parturition (childbirth), endocrinologist Roger Smith and his team made a fascinating observation: pregnant Jewish women observing the fast of Yom Kippur, and thus (albeit temporarily) reducing the nutrient supply to their fetuses, show a peak in delivery rates that is not observed on Yom Kippur in non-fasting Bedouin women living in the same region. Smith’s team was studying the role of CRH in starting labor, and he posits that the stress of inadequate nutrition — even for that brief time — activates the fetal stress system, which involves production of CRH by the fetal brain. Pregnancy involves maintaining a balanced tension between estrogen (which tends to cause uterine contractions) and progesterone (which tends to relax the uterus), to maintain uterine quiescence until term. (Indeed, one of the five proven strategies to reduce preterm labor is giving progesterone injections to at-risk women.) Even as they came to understand estrogen’s role in the onset of parturition, researchers long remained baffled by the nature of the switch that activates the placental estrogen secretion that ultimately tips the scales and kicks off labor…and whether it is in the fetus or in the mother. Studies have now unraveled the involvement of CRH and fetal cortisol in the intricate parturition dynamic. And their most striking discovery? Most of the CRH in humans comes not from the fetal brain but from the placenta! Why is this so striking? Because the placenta — a miraculous organ — is like the advance guard: it is the first organ established in very early pregnancy…completed by 20 weeks…and yet it has a central role in programming the onset of parturition 15-20 weeks later. It’s as if the caterers who arrive to set up for and serve a garden party are responsible for determining, before the party is even fully under way, what time the last guests will leave! (Stick with me here — this really does relate, and it’s kinda fascinating, too!) In the course of studying red-eyed tree frogs in Costa Rica, grad student Karen Warkentin wondered why it could take anywhere from five to thirteen days for their eggs to hatch. What she soon discovered was that nearly-mature eggs — which would remain unperturbed on their tree leaves during wind, rain, and even earthquakes — responded to the minute vibrations of an approaching snake by jolting themselves into hatching prematurely and dropping into the pond below. Warkentin even witnessed a tadpole wriggle out of the mouth of a snake who had just gulped a mouthful of eggs! This “predator-induced” hatching is played out in reverse in other amphibians; some salamander larvae slow down hatching if they sense the presence of predatory gangs of flatworms — thus, “predator-delayed” hatching. And in the Western spade-foot toad, it isn’t predators that influence the timing of embryonic development, it is the environment: if the desert rain-pools in which the tadpoles are maturing threaten to dry up, they metamorphose more quickly, into smaller toads; if the pools hold out, they grow more slowly and metamorphose later, into larger toads. The fetal/placental unit’s early detection of stress signals from the maternal environment “informs” the fetus that there may be a threat to survival. If the nature of the environment is perceived to be stressful or hostile, it may promote developmental trajectories that ensure survival. Survival under these circumstances, however, is associated with long-term costs. Tadpoles that survived by accelerating their development were smaller than normal at emergence as toads and had reduced capacity to forage for food and to mate. We know that the effects of prematurity in humans can include a soberingly long list, including cerebral palsy and problems with every major physiological system and/or developmental delays and learning and behavioral challenges. Scientific groups like Sandman’s adhere to strict protocols when it comes to drawing conclusions. And when it comes to issuing recommendations for pregnant mothers? Yikes, they’re years away from that! They must systematically and painstakingly home in on all nuances of their test groups while teasing out all “confounding factors” that could make such recommendations invalid or inappropriate for other groups. It is an endless (but important) rabbit hole of exacting exploration. I am bound by no such limitations, as evidenced by my recommendations in Parenting for Peace about navigating stress in pregnancy. First let me say that it is never my intention to do that classic maneuver of making a pregnant mom feel more stressed about her stress! This is about knowledge, which is power. This is about empowerment, not guilt. My next post will zero in on the topic of stress in pregnancy — including some practical guidelines and ideas — but for now let me return to the question of preventing prematurity early, in honor of tomorrow’s World Prematurity Awareness Day. Here’s my bottom-line suggestion: rather than following the classic route of waiting until just before your baby is due to shift gears to a more relaxed life pace, consider doing so far earlier. It is an investment that will serve your child lifelong. Timing also matters: research is mounting to suggest that the earlier in pregnancy stress happens, the more likely it is to increase preterm labor risk. And a 2009 study of 1.34 million births over twenty-three years in Denmark suggests that stress prior to conception can also seriously increase prematurity risk. Severe life events in close relatives in the six months before conception increased the risk of pretermbirth by 16%; and severe life events in the mothers’ older children in the 6 months beforeconception increased the risk of preterm birth by 23% and the risk of very pretermbirth by 59%. Remember my comment above that researchers can predict likely preterm labor by looking at CRH levels as early as 16 weeks gestation. 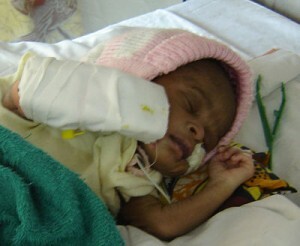 If we look at it from an adaptive perspective, we see a system perfectly designed to respond to environmental information about famine or danger in such a way as to optimize the outcome for the baby — in other words, to spot trouble early and set a trajectory for getting the baby out of a suboptimal womb sooner rather than later. To use my caterer metaphor, it’s like they arrived to find that the supplies promised them to prepare the food aren’t there…or the hosts are engaged in a bitter feud (awkward…! )…or the neighbors have chosen this day to practice their hog-calling yodels. Whatever it is, they can reliably predict early on that guests won’t stay long: the environment isn’t conducive to providing them the pleasant, nourishing afternoon they were promised. If we don’t look at this big, adaptive picture, we are left with the prevailing mechanistic perspective that views preterm labor as something inexplicably malfunctioning in the mechanisms of late pregnancy and labor — “a short-circuiting or overwhelming of the normal parturition cascade” as one researcher calls it. A glitch at the end of the assembly line. But we are not machines on an assembly line. We are multifaceted, mysterious human creatures whose technological prowess has only just begun to reveal the depth of our magnificence to ourselves! This entry was posted on Friday, November 16th, 2012 at 7:12 pm	and is filed under Parenting for Peace. You can follow any responses to this entry through the RSS 2.0 feed. You can leave a response, or trackback from your own site.